This library features breath taking recordings of 60 massive steal and rock bursting explosions. To capture each blast as detailed as possible everything was recorded with up to 19 different microphone channels. These lethal detonations were recorded at a restricted military trainings area in a beautiful sounding abandoned valley in southern Germany. In collaboration with our blaster experts we organized over two hundred and sixty pounds of various heavy explosive substances. This sound pack has been in the planning for quiet a while and we finally found the perfect experts and the ideal location to make our field recording dreams finally come true. Together with Werner Meyerl who is the expert in pyrotechnics, blasting engineering and warfare clearance we have planned this challenging TONSTURM Massive Explosions recording session. With this library we also had the rare opportunity to join and record military operations in addition to our scheduled explosion recordings. 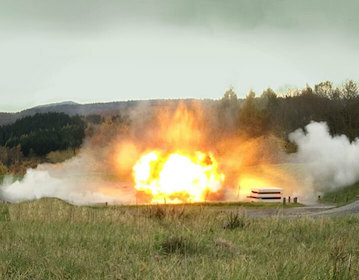 This epic selection of multi channel explosion sound effects is captured using multiple microphones placed at close medium and distant perspective.Over two hundred sixty pounds of explosives have been detonated for this recording session. These following explosive setups are featured in this library: TNT, PETN, ANFO, RDX, Semtex, Black Powder, Flash Powder, Det Cord, Dynamite, Gas Cartridges, Isupropanol, an Anti-Tank Mine, and even more…. Blowing up such high amounts of explosives was only possible at a restricted military area. There would be no place else where you get a permission for such insane explosive charges. To experience them was literally a breathtaking and a lifetime experience. TONSTURM Massive Explosions offers the purest, most powerful and punchy sounding explosion sound effects available.